A rare role in a western for Vincent Price, who shot WITCHFINDER GENERAL and THE OBLONG BOX around the same time. 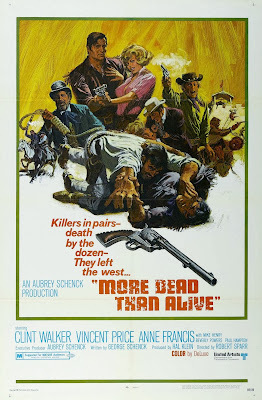 CHEYENNE star Clint Walker takes top billing though as the same genial oaf he usually played. This one is Cain, who once was a steely-eyed killer with twelve notches on his Colt .45, but it’s hard to see it in Walker’s soft-spoken performance. Granted, MORE DEAD THAN ALIVE picks up Cain eighteen years later after a long prison stint. Unable to find a job, he hooks up as a sideshow attraction with a traveling Wild West show operated by Dan Ruffalo (Price), despite his pledge never to touch a gun again. After the violent prison break that opens the picture, not much happens for a long time. 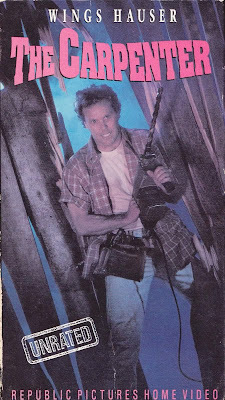 Cain meanders with Ruffalo’s show for awhile, where he butts heads with jealous young Billy (folk singer Paul Hampton, a little hammy), Ruffalo’s hot-headed former star, and he meets cute with artist Monica (Anne Francis), who invites Cain to give up trick-shooting and raise cattle on her land. Will you care about any of this? Not likely. Sure, there is novelty in seeing Price do something a bit different, and the M rating allows the actors to get squibbed up for the shootouts. But the script by George Schenck (still producing and writing NCIS episodes!) 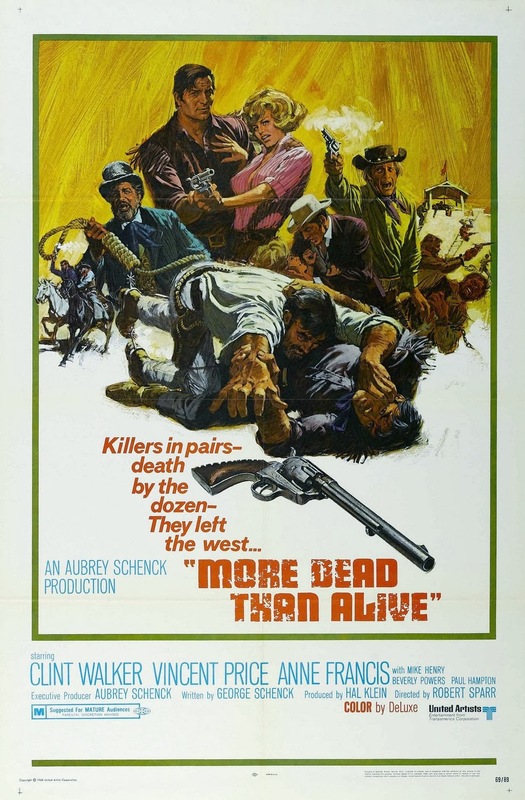 just isn’t interesting, and the late television director Robert Sparr (with eleven CHEYENNE episodes under his belt) hasn’t enough style to compete with the Italian westerns that were changing the genre. Add to those deficits the disappointing ending and the awful music composed by Philip Springer, and you get a film that matches its title. Locations include Vasquez Rocks (Sparr can’t hide that two different sets were built there) and Bronson Canyon. The busy Sparr, who directed only two other features, died in a plane crash in 1969. 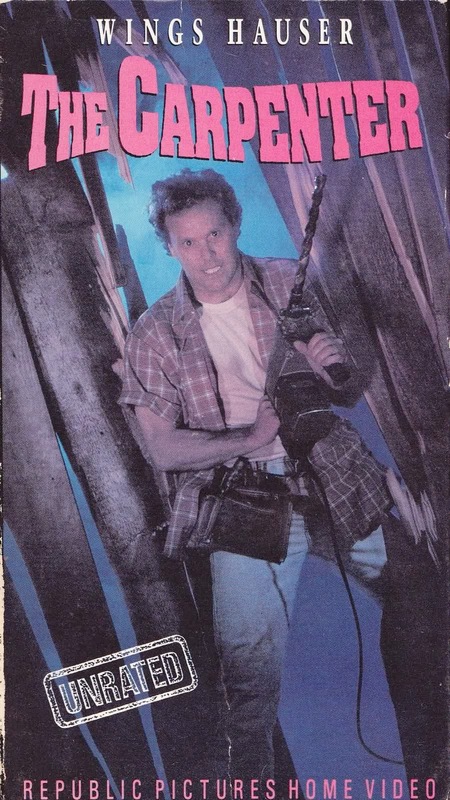 Wings Hauser (the murderous pimp Ramrod in 1982’s VICE SQUAD) is perfectly cast as a raving psychopath in the Canadian horror film THE CARPENTER. Playing, what else, a carpenter. College professor Martin Jarett (Pierre Lenoir) comes home to find his wife Alice (Lynne Adams) cutting up his suits. So he tosses her in the looney bin, eh, and when she gets out, they move into a big fixer-upper in the country. One night, she awakens to find a man (Hauser) hammering-and-sawing away in the basement. He seems nice enough, and she goes back to bed. She sees this carpenter on other nights too—always when they’re alone—and it doesn’t bother her much when he uses his power tools to kill jerks just as nonchalantly as his regular duties. Ron Lea, a terrible actor, pops by the house as the local sheriff in law enforcement’s worst fitting uniform to deliver exposition about the house’s backstory, and Alice determines that the mysterious carpenter is the ghost of Ed, the house’s former owner who committed mass murder in it. And she and the spirit—if it exists—start to fall in love. I don’t know—this is a weird movie, but not an entertaining kind of weird. It’s kinda boring, to tell you the truth, and I think part of the problem is that director David Wellington wanted to tell a classy love story about a woman in a loveless marriage who falls for a ghost, and either the money men or the marketplace demanded a slasher movie with gore. So he halfasses the murder scenes so they don’t make much sense. 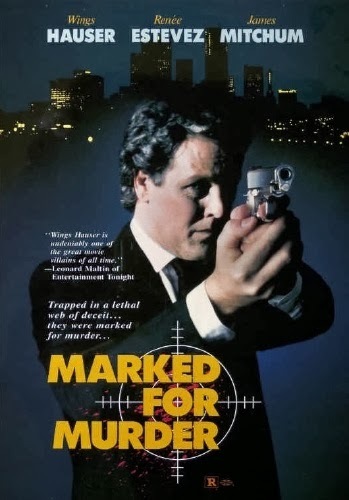 1989's MARKED FOR MURDER is a terrible direct-to-video thriller that is every bit as sloppy and stupid as you would expect from the director of HOBGOBLINS and six VICE ACADEMY movies. It’s ridiculously cheap-looking—a television news set is literally an ordinary desk and a blue sheet—and the worst car chase ever runs red with obvious continuity errors and an actor, screaming in terror while his runaway car is supposed to be in midair, being filmed with the car on the ground and the road clearly visible in its back window. Pacing is insanely slow, the actors thoroughly unappealing, and the writing wretchedly amateurish. All blame goes to Rick Sloane, who not only directed the film, but also produced, wrote, and edited it. Somehow he managed to enlist a few name actors to pick up some scratch for a few days work, and even Martin Sheen (APOCALYPSE NOW) dropped by for a bewildering, wordless cameo as a guy reading a newspaper. I hope it’s on his reel. The star of MARKED FOR MURDER is Renee Estevez, Sheen’s daughter (who played a White House staffer in several WEST WING episodes). She plays Justine, a production assistant at a TV station owned by Emerson (Wings Hauser), who sends her and gofer Corey (Ken Abraham) to recover a videotape from a co-worker’s apartment. The corpse of Kent (Scott Pearson) is later found dead there, and guess who is blamed. 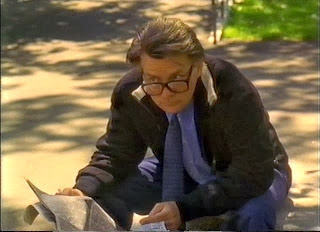 Jim Mitchum (TRACKDOWN) mumbles his part as some kind of cop (the film isn’t really clear), and Ross Hagen (WONDER WOMEN) shows up at the end as a drug dealer. The only fun in this movie is Hauser, who acts totally unhinged and eccentric and is mostly likely ad-libbing many of his scenes that don’t impact the storyline. You may derive some laughter from Hauser’s weirdo performance and Sloane’s ineptness on the set and in the cutting room. I wouldn’t advise finding out.